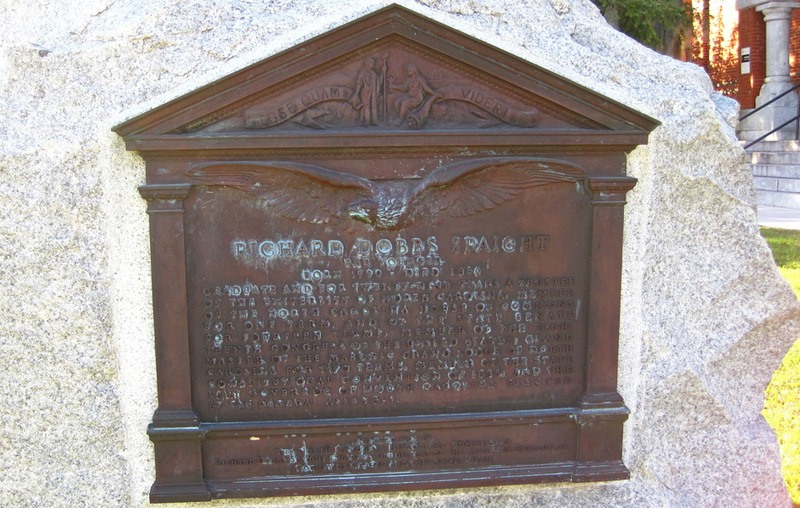 The marker to Richard Dobbs Spaight (Jr.) features a bronze plaque attached to a large boulder. The plaque was cast as the front elevation of a Greek revival architectural style building. In relief on the building’s pediment are several components from the Great Seal of the State of North Carolina, to include the state motto” Esse quam videri” meaning "To be, rather than to seem". Also prominent are the figures Liberty and Plenty facing towards each other. A bas-relief eagle in flight is directly below the pediment with the inscriptions appearing below the eagle’s spread wings. 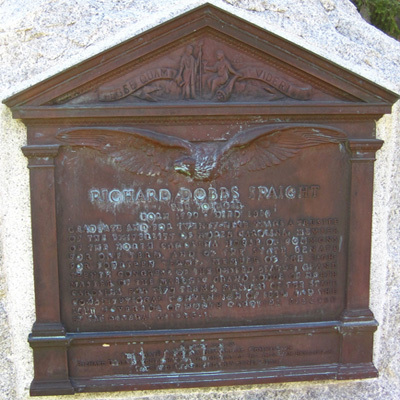 This marker was one of three dedicated on the same day and attached to the same boulder, the “Governors Boulder,” at the Craven County Courthouse. They honor three men who held that position in North Carolina; Richard Dobbs Spaight (Sr.), Richard Dobbs Spaight (Jr.) and Abner Nash. The memorial dedications were a featured part of the first annual meeting of the fifth district of the Daughters of the American Revolution hosted by the Richard Dobbs Spaight Chapter. Mrs. Margaret Donnell Nelson, a lineal descendant of the Speights, and little Miss Arabella Cox, a lineal descendant of Abner Nash, performed the unveiling. Much of the ceremony took place in the courtroom with the presentation of a paper on Abner Nash by Frank Nash of Raleigh and a paper on the Speights by Judge Henry A. Grady. Dr. D. H. Hill represented the NC Historical Society. Addresses were also given by member of the D.A.R. and school children. During the ceremony “America,” “The Star Spangled Banner” and “Carolina” were performed. The commemorative boulder with three bronze plaques is located in front of the Craven County Courthouse near the intersection of Broad Street and Craven Street. The courthouse address is 302 Broad St, New Bern, NC 28560. Craven County WWI and WWII Memorial stands to the left of the boulder if facing the main entrance to the building. The boulder with commemorative plaques stands on the well-maintained front lawn.